Dr. Manshadi received the B.S. degree from the University of Tehran, Tehran, Iran, in 2012; the M.S. degree from the University at Buffalo, the State University of New York (SUNY), Buffalo, NY, USA, in 2014; and the Ph.D. degree from Southern Methodist University in 2018 all in electrical engineering. He was the recipient of Frederick E. Terman Award from Bobby Lyle School of Engineering in 2016. He serves as a reviewer for several IEEE Transactions journals including Smart Grid, Sustainable Energy, Power Systems, and Industrial Informatics. His current research interests include smart grid, microgrids, integrating renewable and distributed resources, and power system operation and planning. Dr. Christopher Paolini received a B.S. degree in Computer Science in 1991, M.S. degree in Computer Science in 1998, and his Ph.D. degree in Computational Science in 2007. All degrees were received from San Diego State University. Throughout Dr. Paolini’s doctoral program, he was an ARCS Foundation scholarship recipient, and as an undergraduate Computer Science student, was awarded a Unisys Scholarship for Academic Merit. He is currently an adjunct faculty member in the Computational Science Research Center and has held adjunct faculty appointments in Mechanical Engineering and Computer Science here at San Diego State University. Dr. Paolini has 15 journal publications, 44 conference publications, a book section on Algorithms for Higher‐Order Mimetic Operators, and has participated in numerous invited talks, professional workshops, and panels. He recently served as a faculty mentor for the SDSU team of undergraduate Electrical and Computer Engineering students at the IEEE/ACM Supercomputing ’17 conference Student Cluster Competition, served as a faculty mentor for a team of Electrical and Computer Engineering graduate students participating in the entrepreneurial Lavin VentureStart Competition, and served as a mentor for an Electrical and Computer Engineering McNair Scholars Summer Research Program undergraduate. Dr. Paolini’s current research interests involve machine learning, Internet of Things applications, cloud computing, big data analytics, and deep learning. The College of Engineering announced that the Donald G. Wilson scholarship has awarded a total of $60,000 for the 2018-2019 school year. Click here to access the news release online. On March 9 and 16, 2019, SDSU hosted the BigData Hackathon here on campus in Peterson Gym 153. The BigData Hackathon is a free event open to both students and community members from all disciplines. The idea of the hackathon is to bring these people together to work in teams to solve real problems here in San Diego. We are proud to announce, the first-place winners in the "Aging Independently" category of this year's hackathon were our own students from both the Computer and Electrical Engineering programs, team F.A.M.E - Find And Manage Elderly. F.A.M.E received a prize award of $500 sponsored by SDSU ZIP Launchpad. Their project was to predict daily activities of an Alzheimer patient using a machine learning algorithm. This algorithm sends a text message to the patient about their next activity in order to remind them of the daily things they need to be doing. F.A.M.E's team members were Omar Aljedani (undergrad-EE), Kinjal Gala (grad-EE), Gurami Keretchashvili (undergrad-CompE), Nika Nizharadze (undergrad-CompE), and Saipriyati Singh (grad-EE). Congratulations to the F.A.M.E team!! SDSU Researcher Mahasweta Sarkar. Click to read the article in the SDSU NewsCenter. Capacitive Power Transfer with one Pair of Metal Plates"
and ranked No. 86. Click here to read the article in the SDSU NewsCenter. the last five years (2013-2017), IEEE Transcations on Electromagnetic Compatibility: "Modeling of Crosstalk in Through Silicon Vias"
Technology Award: "Long Distance Capacitive Power Transfer with One Pair of Metal Plates"
Dr. Ke Huang - Qualcomm Inc.; Innophase Inc.
Dr. Mahasweta Sarkar - ViaSat Inc. 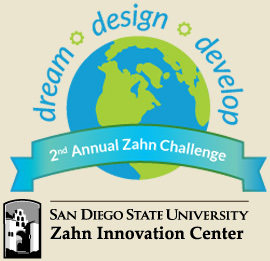 Apply to the $50K Zahn Challenge for SDSU students, faculty and staff with an idea for a commercial enterprise, social enterprise or project resulting in a social impact. The Zahn Innovation Center is a commercial and social incubator that supports San Diego State University innovators and aspiring entrepreneurs—students, faculty and staff from any major or department on campus—as they transform their ideas into companies. Please join us at our annual College of Engineering Design Day! View photos of the event. The San Diego State University senior engineering Design Day presents a collection of projects from graduating seniors. The San Diego State University College of Engineering will host its annual Design Day on May 8, 2019 from 1:30pm-4:00pm in Montezuma Hall, Conrad Prebys Aztec Student Union. The event will feature project demonstrations from graduating seniors in the engineering program, as part of a capstone design class. Design Day exhibits a collection of projects from graduating seniors from Electrical and Computer engineering majors. This event is well attended by representatives from local industry, parents and faculty from other departments.